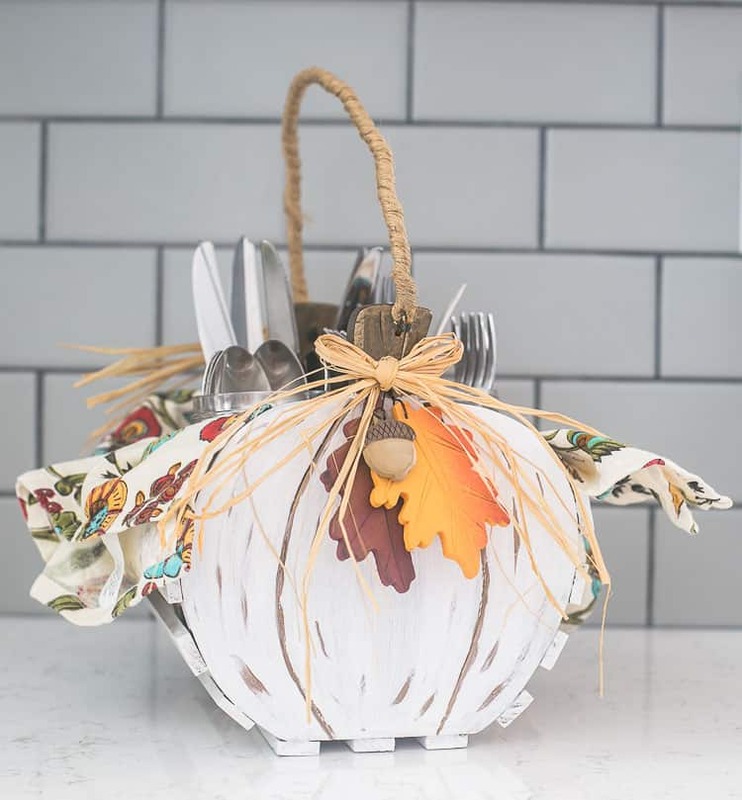 A couple months ago we found this Thrift Store Pumpkin Basket for only $1. It was brand new, still had tags attached at Kohls, it just needing a new home. So home with me it went and it sat in my office stash until this past week when I gave it a little paint update. I turned it into the cutest fall pumpkin basket. 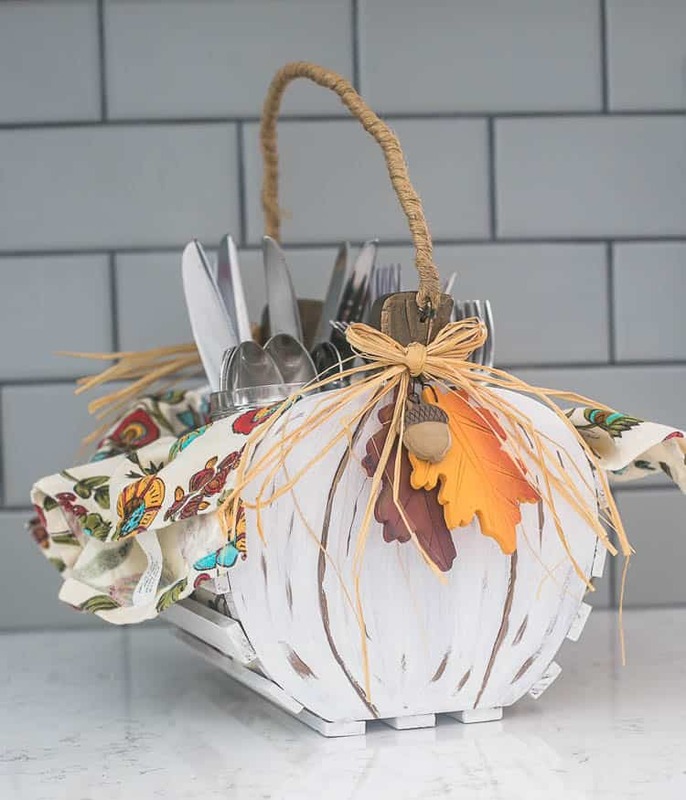 It makes a great utensil holder, but would also would be adorable for piling up with fresh, hot rolls on Thanksgiving. 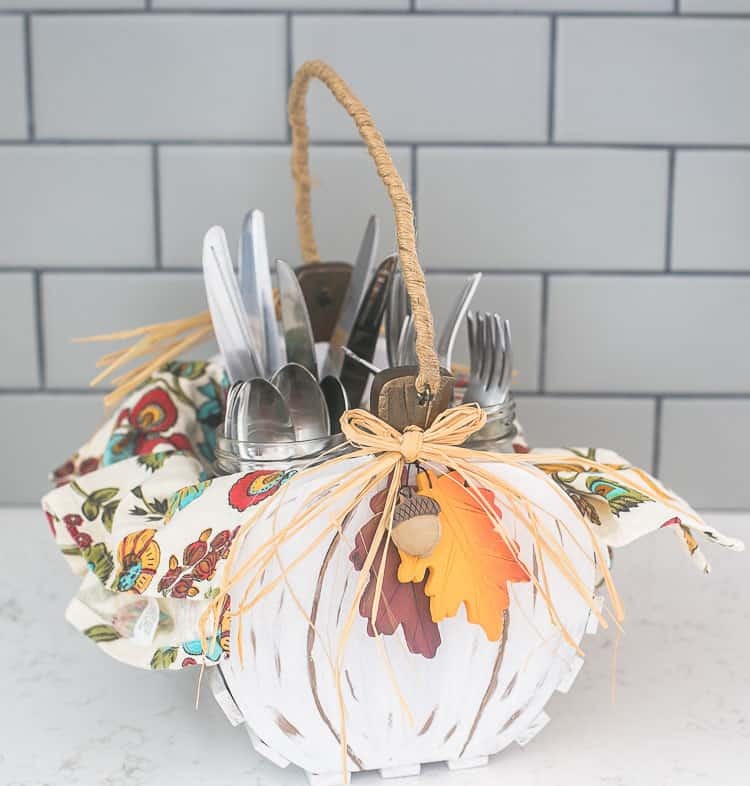 The pumpkin basket was so cute to start with, I just wanted to go with a more neutral pallet. 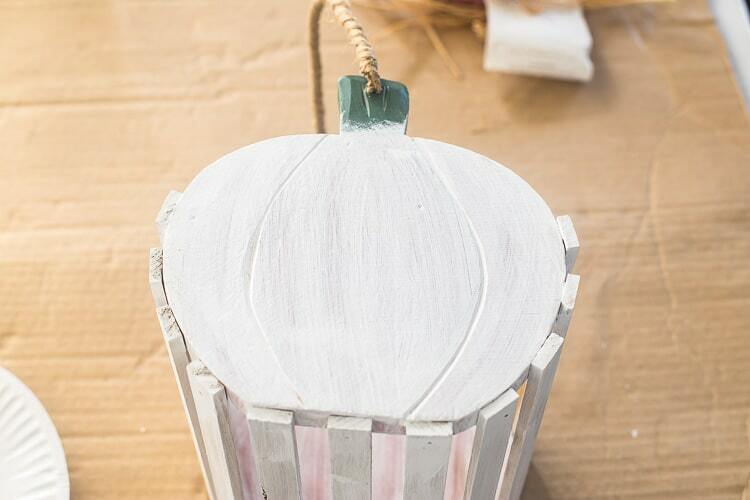 So I gave the orange pumpkin and the wooden slats a creamy, white makeover. 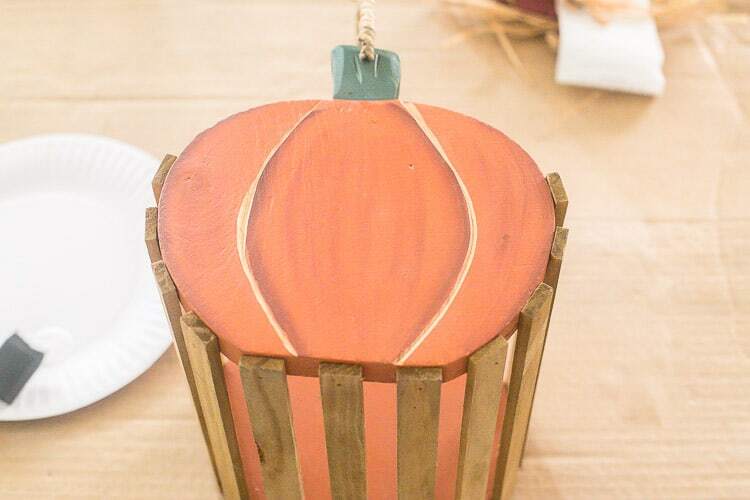 I finished off the pumpkin with PAINT for the stem and the used the same color to add some definition lines. 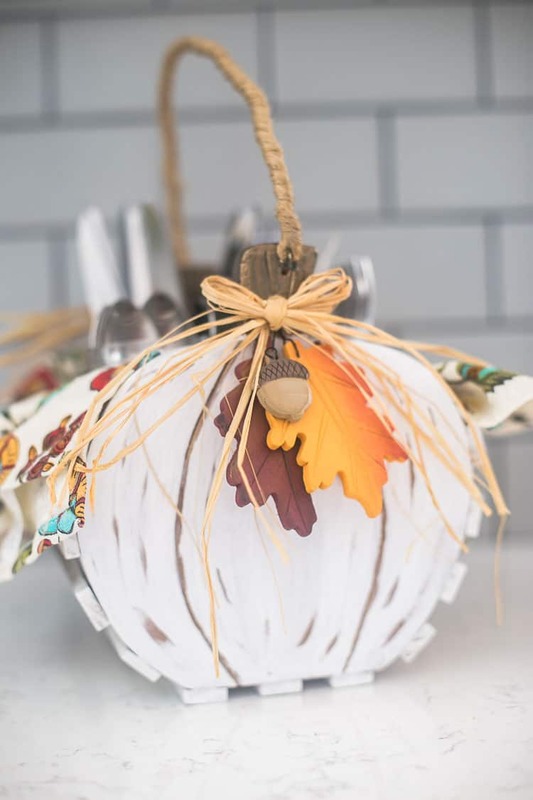 I hot glued back on the raffia, leaves and acorn decoration. 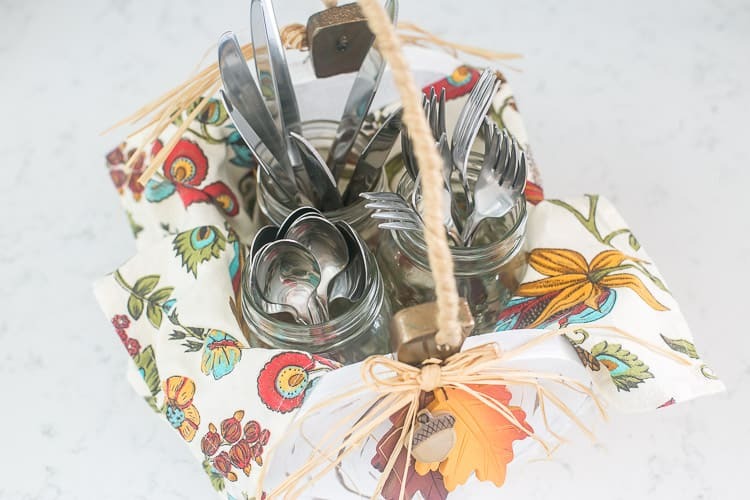 I placed a pretty napkin in the bottom of the basket and then added 3 mason jars for the utensils. I think he turned out pretty darn cute! 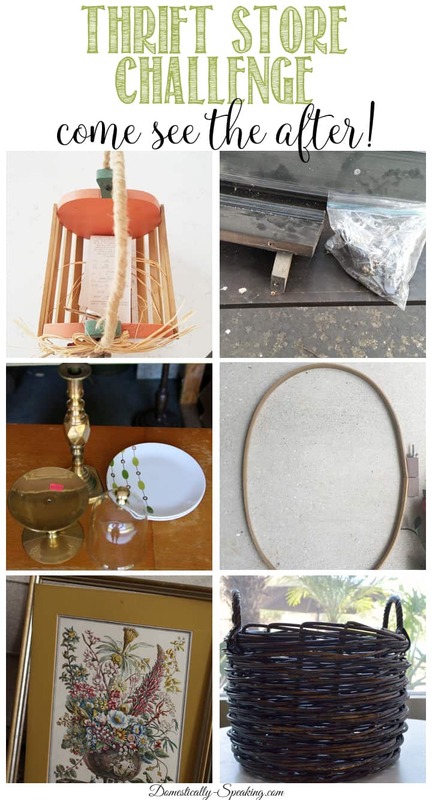 Now make sure to check out what the other ladies created for their Thrift Store Makeover. This looks amazing! So much better than the original. Thanks for sharing this on Merry Monday. Pinned. This is so adorable! I’ve seen these or similar for the seasons in the thrift store. Never again will I pass over one again! That’s a great save on that pumpkin basket. It looks beautiful now! Oh it’s so cute, much better than the original! I would not have been interested in using it in its original state, but in its new life it would have been in my basket. You did a great job on it, Maryann. Wonderful idea and you did a top-notch job!! Love your blog and have a lot of your projects on my bucket list!! The basket looks so much better now. I probably would have passed it up. Good Save! 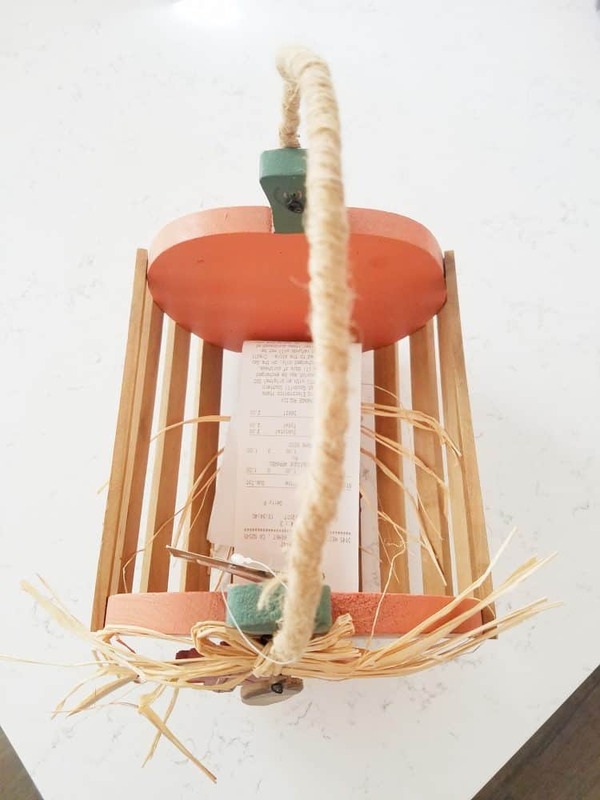 I love it painted white and used for a utensil holder, so pretty!